Another significant buy signal is emerging for gold. Experts believe we’re quickly approaching ‘peak gold,’ meaning production could soon hit its permanent ceiling and begin declining – while demand continues to grow. 1) Discovered – When a resource is found to have economic value, its supply is tapped for the first time. 2) Supply Rush – After the resource is first discovered, its massive reserves are easy to mine and harvest, which results in a supply rush (e.g. the American gold rush). 3) Booms & Busts – As a market forms around a resource after the initial supply rush, production goes through booms and busts. Harvesting the resource in question grows harder with time, but technological advances intervene. Production maintains a steady upward trajectory in the long-term, with many ups and downs in the short-term. 4) Peak Production – Eventually, increased production efficiency from technology isn’t enough to negate the reality of the resource’s dwindling finite supply. Once production reaches this ‘peak,’ it cannot increase any further. 5) Production Decline – After production hits its peak, it steadily falls as the finite resource supply comes closer to being exhausted. 6) Exhaustion – Finally, the resource’s supply is entirely tapped. Production slowly comes to a complete stop. But what does all this mean for the price of a resource? Well, supply/production is only one half of the equation. The other half is demand. And that’s where things get especially interesting. That’s because supply/production of a natural, nonrenewable resource is a zero-sum game. It spikes strongly in the beginning, grows steadily until hitting its peak, and then declines to nothing. But demand is a totally different story. As supply/production slows down, scarcity grows and demand tends to speed up in response. 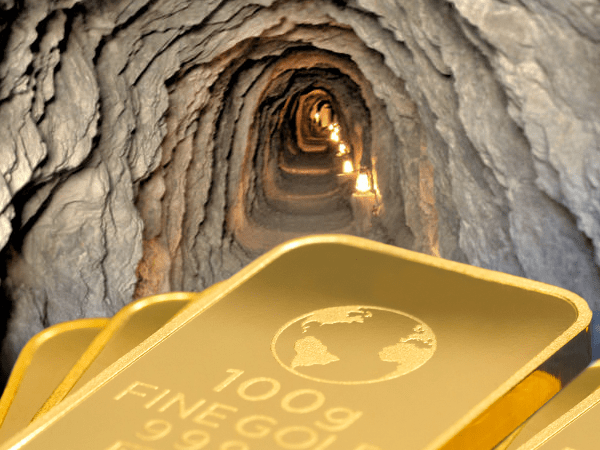 How soon should we be looking for ‘peak gold’ to manifest itself? If you’re thinking along the lines of 5, 10, or 15 years… think again. According to mining industry experts, ‘peak gold’ could be just around the corner. Randall Oliphant, chairman of the World Gold Council, predicts today’s environment of rising demand and stagnating production could be ushering ‘peak gold’ in right now. In fact, Oliphant believes 2017 will be proven as the year of ‘peak gold’ within the next 12-24 months. Production is likely to plateau at best, before slowly declining as demand rises, especially given global political risks and robust purchases by consumers in India and China, Randall Oliphant said in an interview Monday. Oliphant’s concerns over peak production echoed similar comments at the conference, being held this year in Colorado Springs. David Harquail, chief executive officer of Franco-Nevada Corp., said earlier Monday that the gold industry continues to be in an ex-growth phase where new mining projects are simply replacing older assets that are running out of ore.
How High Could Prices Rise? If experts are correct in their ‘peak gold’ predictions, production will likely plateau in the months to come, before beginning to falter and decline. Meanwhile, global demand is on the rise, with no signs of slowing down. As a result, Oliphant is making a conservative estimate that gold prices will reach at least $1400 in the next year. But from a longer term perspective, prices could climb far higher. Add to all this the growing volatility in international politics, and the increasing flight to safe-haven assets, and you can clearly see a perfect storm brewing for gold prices.